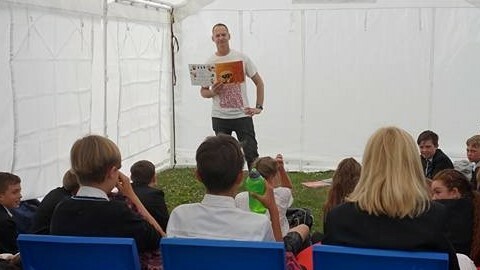 I ran a creative writing workshop at The Regis School in Bognor recently. The school wanted to inspire some of their more reluctant readers/writers in Year 7. I discovered from my Teachers as Writers project with Arvon how important it is to get children away from their normal classroom space and into somewhere more relaxed and enjoyable. So I suggested we have the day in a tent! After pre-warning the teachers of my plan, they managed to borrow a giant gazebo-like tent from the local Scout troop. When I arrived we set up in the school grounds, and the students took to the new atmosphere straight away. They all wrote lots – and really enjoyed themselves as you can see from the comments below. The teachers were surprised by their level of engagement and the quality of their work. We’re going to repeat the experience hopefully in September.